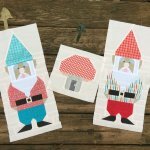 Gnome At Home is a 12 month block of the month program with 12+ unique patterns to create an adorable garden themed quilt. This is a digital pattern that will be delivered via email on a monthly basis beginning February 15, 2019. Gnome At Home is a fun new block of the month pattern by designer Kristi McDonough/Schnitzel & Boo featuring birdhouses, fairy house toadstools, frogs, flowers and lots of other gnome-friendly garden blocks. Each month you will receive pattern and instructions for a different block to construct this king-size medallion style quilt. Each completed block will be entered into the monthly prize drawing, as long as the block is sewn and posted before the next month is released. Every completed quilt is entered to win the grand prize package which includes fabric and thread packages from some of our favorite manufacturers, free longarm quilting and even a brand new Eversewn sewing machine (and more!) Participants (hereby known as "Gnomies") will have access to a private Facebook group where you can participate in scheduled Facebook Live sew-alongs, share tips, tricks and ideas with other Gnomies and get inspiration for this and other sewing projects. 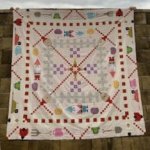 For more versatility, other free projects will be shown using the individual blocks-you don't have to make a quilt! 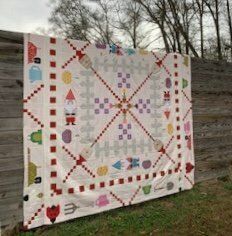 The Cotton Farm will offer a special discount codes to use on fabric, notions and long-arm quilting for all participants. to the Gnomie FaceBook group and send your patterns to this address.